Period home owners and architects wanting to choose a traditional roof material that’s a good match with a particular house style often find the answer isn’t so simple. Roofs of the past were likely based on economics as much as aesthetics. And when historic revival styles paraded through the modern era, roofs followed the day’s fashion and local tastes no less than architecture. Nonetheless, considering a few common trends and the insights of some roofing experts can help make the decision easier. Period Architecture designed this new home in Chadds Ford, Pennsylvania. For builders in timber-rich North America, wood shingles were the obvious choice for the earliest roofs, and ultimately the most common roofing material for houses well into the 20th century. Originally hand-split from local woods—oak and pine in the Northeast to cypress in the South—wood shingles were typically shaved smooth for high-style and garden-variety houses alike, perhaps even decorated with rounded butts. After 1840, stationary and portable mills produced the sawn shingles common for Queen Anne and Shingle-style houses of the Victorian period, often stained in greens or earth tones. When railroads reached the Pacific Northwest in the 1890s, Western red cedar, rot-resistant and abundant, soon dominated the market across all house styles. Wood shingle roofs began to wane in the 1920s in the face of newly developed asphalt shingles and calls for improved fire safety. Their last flourish came in the late 1920s and ’30s with the fad for Tudor-ish, thatch-effect roofs created by cleverly steaming and bending the shingles over a rounded frame. Specialty companies even marketed pre-stained shingles in kaleidoscopic colors for equally fanciful revival-style roofs. 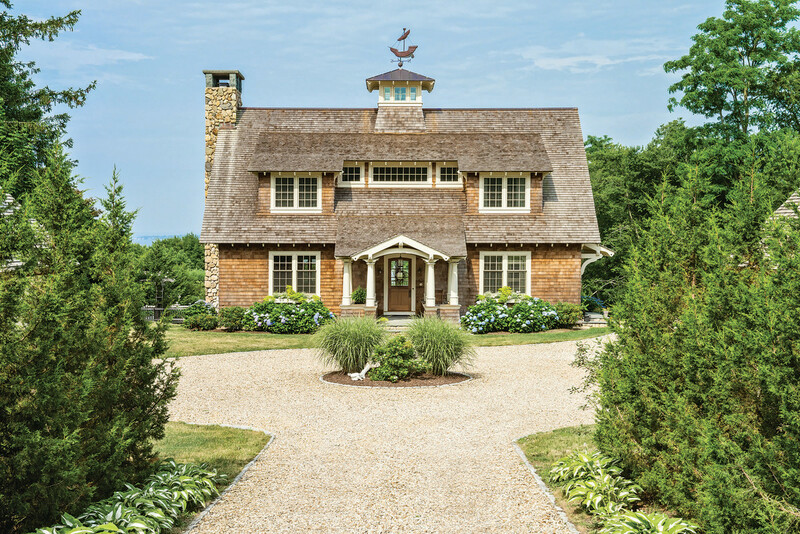 Architect David Andreozzi designs a Shingle-styled house with wood roof with traditional rafter tails in Rhode Island. When the ranch house style became the rage in California in the 1950s and ’60s, manufacturers and designers reincarnated wood shingles as rough-split “shakes” to evoke a rustic (though imaginary) pioneer appearance. Since then, the limitations of reduced service life and threat of fire have made wood shingles an increasing challenge for all but museum buildings. 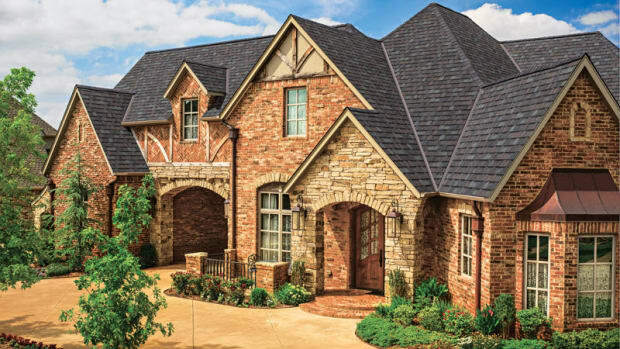 To fill this void, recently there’s been a rebirth of non-wood, but visually shingle-like roofing materials, such as products made from terra-cotta-tile (see Clay Tile) and recycled rubber or plastics. 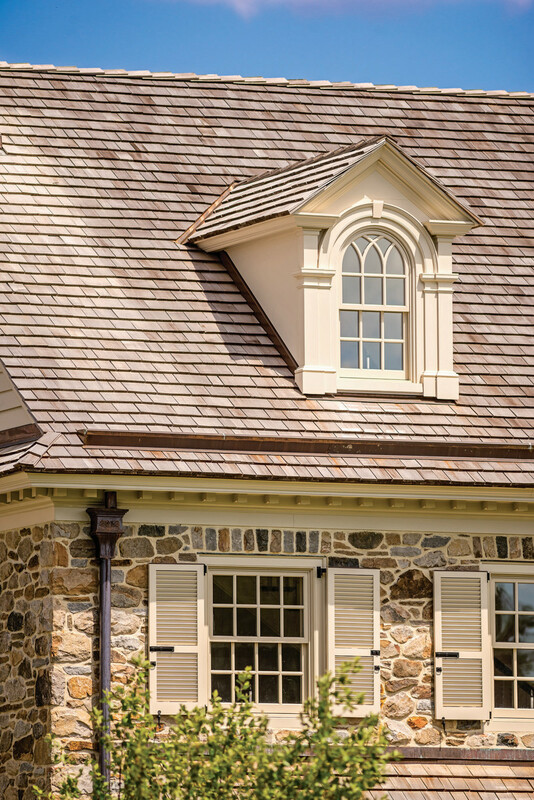 Metal roofing is a popular choice for historically-inspired houses. 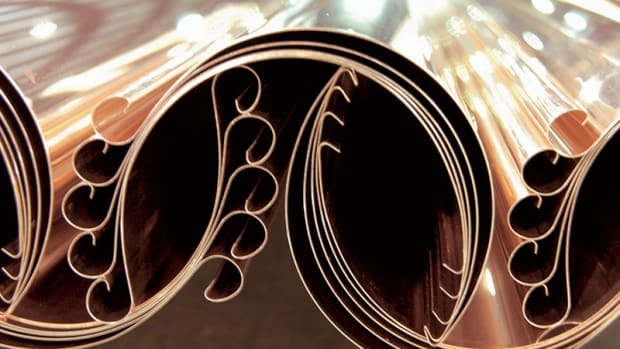 Sheet lead and copper have been soldered into flat-seam roofs for centuries—long before Thomas Jefferson’s 1740s roof at Monticello—but the more common metal roof type is the standing seam. Here, long panels of metal 24” or so wide are first bent up about 1 ¼” along both edges. “These panels can be roll-formed right on site,” explains Michael Papania of Heather & Little Ltd. in Ontario, Canada, “with custom lengths to fit the roof.” Next, the panels are placed side-by-side and joined in a seam (along with tabs that anchor the metal to the building) by crimping a folded strip of metal over the up-turned ends. 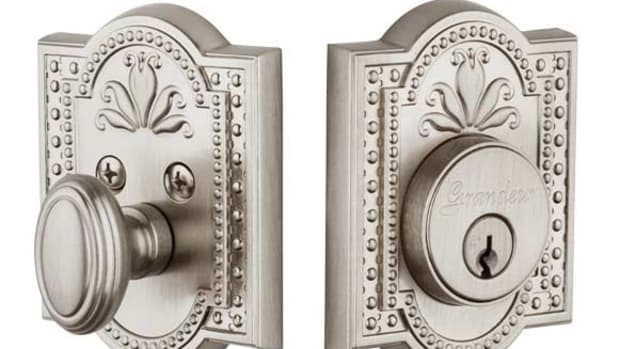 This creates a joint that stands high enough above any running water to avoid leaks. Economical and highly durable, standing seam roofs have been popular in the South for all styles of gable-roofed houses since the mid-19th century, and are often seen, wholly or in part, in the North and Canada where snow and ice dams are a chronic problem. “A low-slope roof is the perfect candidate for a standing-seam panel roof,” adds Papania, and indeed standing seam is the traditional choice for porches as well as on low-pitched, modern-style houses. 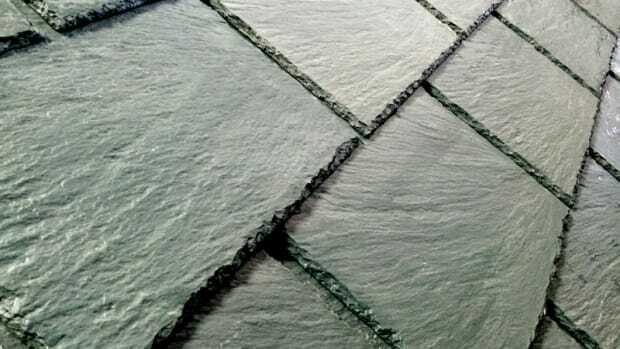 Second only to wood as a natural, traditional, roofing material, slate is a fine-grained sedimentary rock that has topped castles and large buildings for centuries in Europe. Imported from Wales to colonial America for fire-proof roofs in Boston, Philadelphia, and New York, it was still slow to catch on for houses. After 1830, though, railroads not only made weighty slate more accessible, changing tastes and a growing suburban culture deemed it desirable. In the 1840s, America’s first design maven, Andrew Jackson Downing, extolled Rural Gothic-style cottages as the paragon of picturesque residential architecture. In Cottage Residences, Downing explains how, “A very pleasing mode of covering roofs [is] cutting the lower ends of [of shingles] in a semihexagon or semioctagon shape,” or even “rounding the lower ends” to produce a fish-scale appearance. In early examples, Downing’s roofs are wood shingles, but in later plans he recommends “Peach Bottom slates (which are the best quality)”—a reference to the first commercial U.S. quarry in Peach Bottom, Pennsylvania, opened in 1785. Slate was especially soigne, he felt, for “French Roof Houses” where the lower part of the inimitable double-pitch mansard roofs could be imbricated in patterned shapes and colors, such as green, purple, and red. By the 1870s, as truly large houses become more widespread, prominent roofs continued to grow in importance. Along with mansard roofs on Second Empire and Italianate houses, slate in “cornered” and “rounded” forms found even more use covering the complex turrets and intersecting gables of the Queen Anne style. When convenient to the major slate belts in Pennsylvania, New York, Vermont, and Virginia, slate was practical too for more prosaic dwellings and even farm buildings. Regardless of whether the slates appeared in creative shapes or colors, so long as they were of uniform dimensions and exposures, the installation was considered a standard roof. However, at the dawn of the 20th century, the growing fashion for English-revival houses ignited an intense interest in “architectural” slate roofs—an almost complete about-face in slate appearance and yet probably the historic peak of the industry. 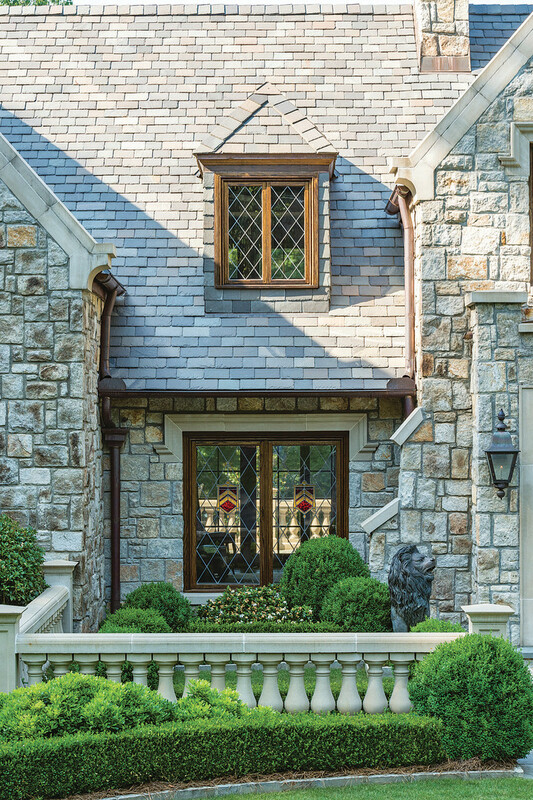 To evoke the supposed look of medieval hand-craftsmanship on the Tudorbethan or Cotswold Cottage-style houses transplanted to suburban Connecticut, Ohio, or Michigan, architects could specify a textural roof. Here, in stark contrast to a standard roof, slates are cleverly selected and laid to appear as haphazard in width, length, thickness, and character as possible, thereby producing a highly theatrical impression of centuries of age. As if such slate-sleight-of-hand were not enough, slates could also be laid as a graduated roof where each course of slates diminishes in exposure (and often dimensions) like organ pipes with each succeeding course up the building. This installation method dramatizes the height of the roof and was most effective on large houses. As the vogue for ersatz English manors and cottages started to run out of steam during the Depression, the Pennsylvania Slate Roofing Institute summed up slate for homebuilders in a 1930s brochure. 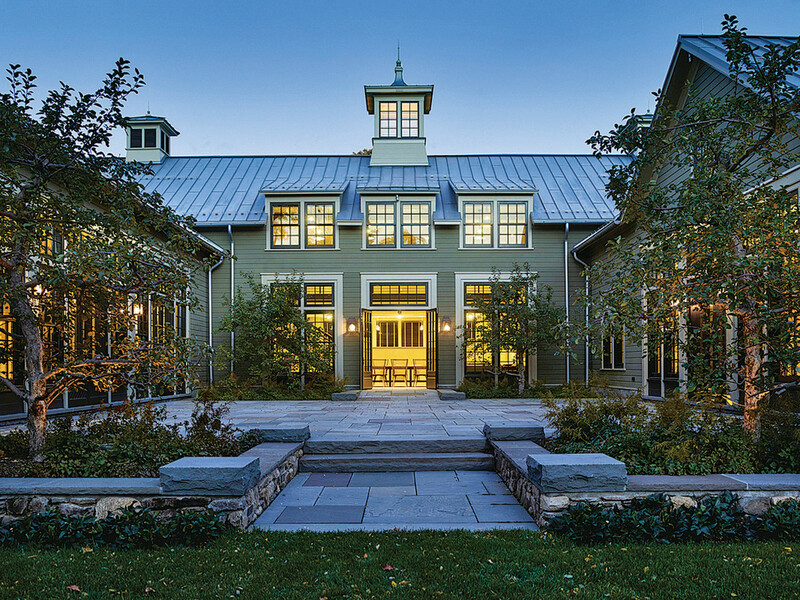 “From an architectural standpoint, roofing treatments divide into two classes,” they wrote. “Rugged irregular lay for informal types such as the English and Norman, and conservative, regular treatments to complement the more formal lines of Colonial and kindred architecture.” The Institute added, “Modern architecture recognizes the charm of the slate roof,” thereby laying out the options that still apply today. Not unlike slate, clay tile roofs served ancient China, Greece, and Rome for centuries and the Spanish, French, and Dutch found it worth importing to settlements in Florida, New Orleans, and the Hudson Valley because it was durable and fireproof. Use waned after the colonial period but, when interest in revival styles of architecture ramped up in the mid-19th century, so did clay tile. The popularity of Italianate style after 1850 was a natural lift for tile, but what really boosted appeal was the 1876 Centennial Exhibition in Philadelphia, which showcased tile roofs on several major buildings. Within a decade, the mode for the beefy Richardsonian Romanesque style and kindred masonry architecture found the bold lines of clay tile roofs an ideal complement. On top of this, the first tile-making machines, patented in the 1870s, augmented tile production formerly made all by hand, and expanded the industry to a wide variety of shapes, origins, and installations. Michael Burch restores a pool house with a clay roof in California. Clay tile use ebbed when the Romanesque and revival styles grew passe, but rebounded after 1900 as a near-perfect roof for Arts & Crafts houses. Architects working in this proto-modern movement loved clay not only because it was “natural” but also versatile. For example, a simple, one-and-a-half story bungalow gained an outsized presence with a pyramidal roof of undulating Spanish tiles. Conversely, a rustic log house could affect a sophisticated wood shingle roof with flat tiles. What’s more, newly perfected colored glazes opened up a palette of rich greens and bright reds far beyond the earthy tones of fired clay alone.